What kind of projects and work do you think might be needed by designers because of the Great Acceleration? What are two ways that the changes resulting from the Great Acceleration are affecting your life? I think the fashion products needs more sustainable designs because I think fashion industry or clothing production industry shows an apparent great acceleration during their development. In the past, clothes just the necessities of life for people, the fashion maybe just for upper class, but in today, with many reasons, fashion become the trend that everyone pursues, it forms a huge business, and clothing has become excess goods. But people in the world still pursuing new clothes, so clothing changes from the necessity to consumable, the balance between demand and consumption is broken. Because of the rise of the fast fashion industry, I’m buying much more fashion products than before. It always motivates me to buy more, so that I buy too many clothes, many clothes I’m sure I won’t wear the second time. The electronic products are also updated too fast. Many software cooperates with hardware manufacturers continue to require a higher hardware configuration, also because of my personal psychological factors, I keep updating my cell phone and laptop every year, even though that maybe not necessary for me. It made me spend a lot of unnecessary costs I think. What do you think it means to“think and design beyond the present” as a designer? Why might this be important? The designer’s job is creating things that not exist at present, and also need to think the function and future using of the thing that been created. The designer also will make a future influence. They need to think about what factors will lead to different effects in order to ensure that the influence is positive. So if designs do not take into account the effect on the future, it may become a useless design or even cause more negative impacts. Research the word Anthropocene and write a short description that you would share with a close friend (using your own words/language to explain, not an internet definition).What is one example of how the Anthropocene is affecting your home country? Images are encouraged. Anthropocene is the recent history of our earth. It has no exact start date because the date is controversial. Many scholars think the Anthropocene is the period when human’s production activities or industrial activities begin to have an impact on the Earth’s environment. I live in Beijing, with the development of my hometown, more and more factories were built around the city. They are causing serious pollution to the air environment in Beijing. 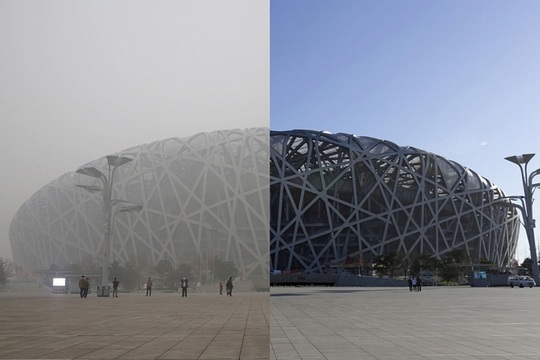 Since 2010, Beijing began to haze weather, and the air pollution is getting worse. People in Beijing have to wear masks every day when they go outside. But until today, the number of factories is still growing. Read the following article,“Everything that’s in your iPhone” (Links to an external site. )Links to an external site.. What surprised you most about this article? What are some of the locations involved in the process of making an iphone (list three)? What are some of the materials (list three)? Describe some the effects (at least 2-3) that these materials have on humans, air and water systems. I am surprised that the material cost of an iPhone is so cheap, its precious metal content is very small, and the rest are very common cheap metal, these metal elements may impact an iPhone’s recycling value. Many metal materials make up an iPhone, such as Aluminum, Cobalt, Gold, Bismuth, Copper, Iron and much more. It is very difficult to mine these metal materials, but these metals are present in some impoverished countries. So, those country’s people in order to get more profits are often desperate. They have to work in the mining area with significant risk; many people were killed in the mine every year. Using child labor is also a widespread phenomenon in these countries. Because they are short, they are forced work in places where adults cannot reach, but these places even more danger. These working environments are devastating for the growth of children. Mining activities can also cause damage to the environment. Mining aluminium can devastate the natural landscape and imperil natural habitats. Mining activities will produce a large number of toxic waste, and they will cause irreversible pollution for the local water source. Do you use any of these materials commonly in your work or personal life? Yes, a lot of daily necessities I using all containing these materials. Will you change your behavior as a result of watching these videos? Yes, I think I will try to use fewer chemical products, and use more products which made from natural ingredients. When I buy those products, I will see more their ingredients list. Why do you think so many chemicals exist in contemporary designs? Because these chemicals can increase the production efficiency and be using effect or cut costs, also people may do not care about the environmental impact which they are not easy to see; they only care about the immediate effect or what material will let them save more money.